Graham's and Scotmid have announced a new partnership. "Like us, Scotmid are rooted in Scottish communities." Scotland’s leading independent family dairy is to embark on a major new retail relationship with the country’s largest independent co-operative societyFollowing a successful trial in stores in Edinburgh, Graham’s The Family Dairy will supply milk and butter to all Scotmid stores throughout the country. 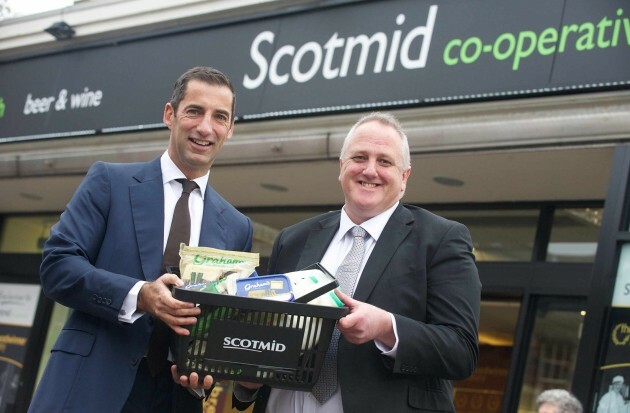 Scotmid Co-operative has been at the heart of Scotland’s communities since 1859 and as a long established Scottish farming business, the new deal with Graham’s represents a significant step for both companies. As a result of that, Graham’s will supply 2 litre Light and Low milk, Scottish salted and unsalted butter and 250g packs of spreadable butter to more than 200 Scotmid stores. In addition, Graham’s Organic and Gold products made with Jersey milk will also be introduced to selected shops. Graham’s have been dairy farmers for three generations and the business started supplying local independent shops. The new deal builds on those origins and is the first step in a growing relationship with Scotmid. Graham’s The Family Dairy Managing Director Robert Graham said: “We are delighted our products performed so well during the trial in Scotmid stores and over and above that, we believe the company is an ideal retail partner as it shares our aims and aspirations. Like us, Scotmid are rooted in Scottish communities and we really appreciate the opportunity to work with them to give consumers increased access to our range of products”. With shops across rural and urban Scotland, the Scotmid deal gives Graham’s a platform to supply a whole new customer base.